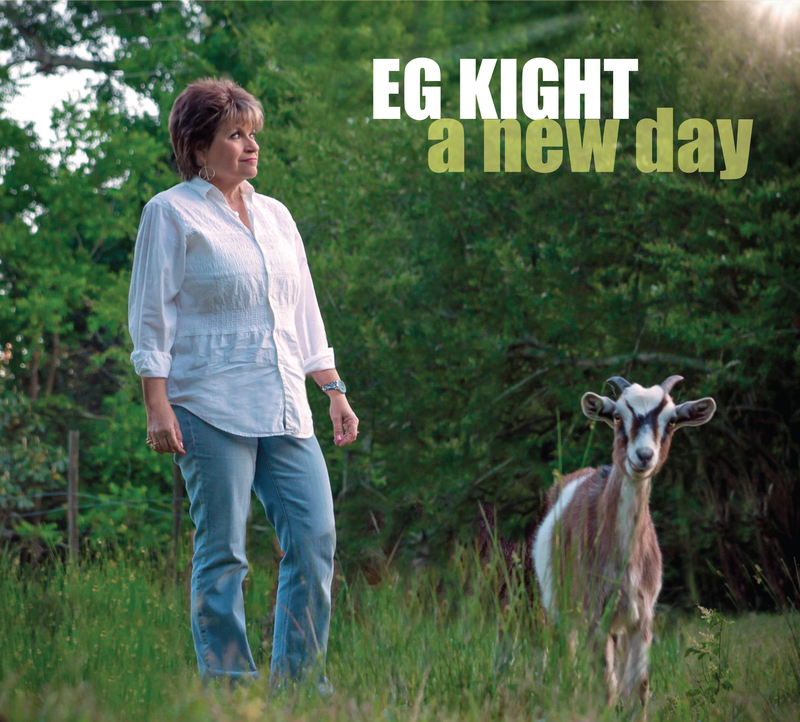 Welcome to EG's website – for news about her music, photography, and pet goats! SHOP – Music On Sale! HAPPY 2017! RECAP OF 2016! And today is a new day, the first day of a brand new year. I wanted to take some time today, to review last year, and share the things I look forward to this year. In 2016, I did some exciting things, and even marked off one of the things on my bucket list. – With my Blue South Band, we helped Gary Anton celebrate his birthday, along with mine, at Bradfordville Blues Club. If you haven’t been there yet, and you’re a true blues lover, you absolutely have to check it out. It’s one of the coolest venues I’ve EVER been in, and once you get a taste of the vibe there, you’ll want to keep going back. 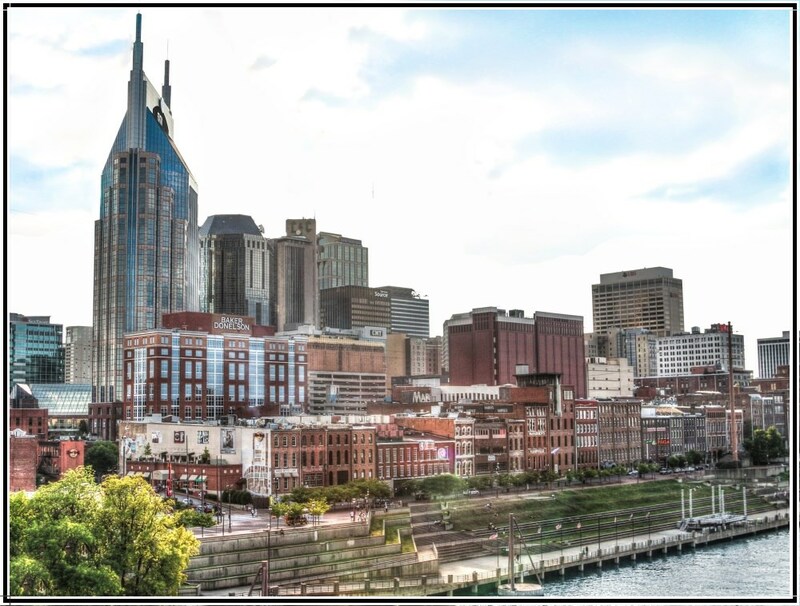 – I spent some time in Nashville, which I hadn’t done in a while, had several co-writing sessions, and even performed in a writers round at the Commodore Club, hosted by Debi Champion. It was great to see and hear old friends, JC Ward, and Diane Gentes! It brought back a lot of memories from the old Bogie’s and Broken Spoke days. – I performed at more house concerts, and I just have to say that I REALLY enjoy doing that kind of a show. It’s an intimate listening room environment, and I can practically reach out and touch my audience from the stage. I love the feeling of being so close to the fans, and they seem to enjoy the up-close-and-personal concerts. 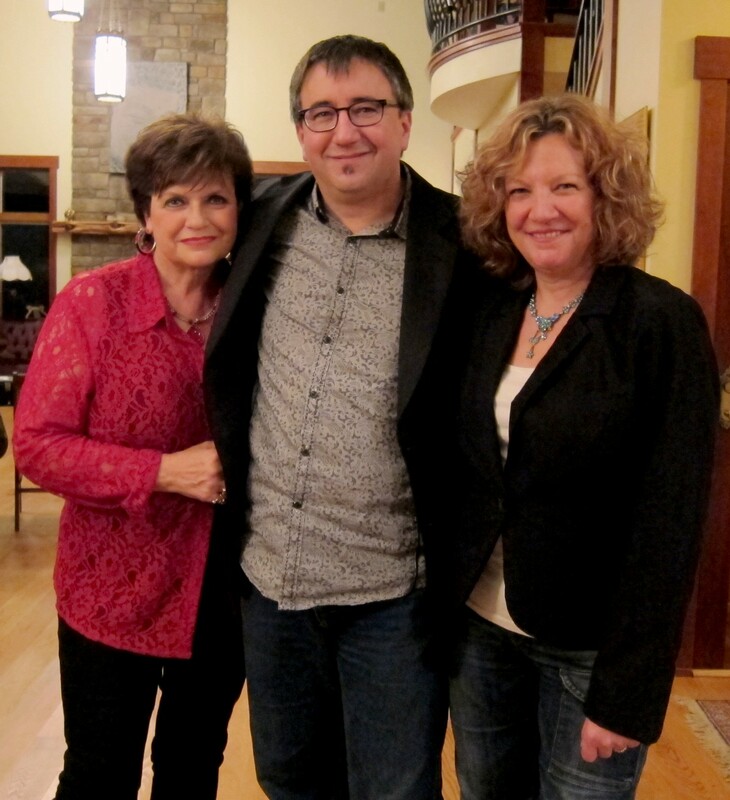 – I did another singer/songwriter night with my longtime friend, Becky Hobbs, and Lucy Billings, at the Renaissance Arts Center Theatre in Kingsport. There’s something so comfortable about sharing the stage with friends and hearing them sing their own songs. I had the best seat in the house! – And my friend, Michael Buffalo Smith invited me to do another writers round with Sonny Moorman and Russell Gulley, for a benefit for The Big House Museum. That was a fun afternoon, too, and it was for a good cause! – One of the most exciting writers shows that I did was in my own hometown of Dublin, Georgia! I was part of the launching of a new songwriters series for ExploreGeorgia.org, celebrating “The Year of Georgia Music.” Levi Lowrey and Greg Hester joined me at the Historic Carnegie Library, and we sang our original songs for my hometown fans. Thanks to Lisa Love and Jody Jackson for putting that show together, and inviting me to be a part of it! – I also did some shows up in Ohio, Indiana, Alabama, Pennsylvania, Florida, and Mississippi. From a concert in an apple orchard, to clubs, to house concerts, to a membership kickoff event for Marcia Adams and her new Indy Blues Society, to a chapel concert series, to a theater, a museum, and a yacht club, to festivals, to private parties, to a coffee house, I had a great year! I love performing for old and new fans alike, and I’m excited about some things we’re working on for this year. We’ve got some different things on the horizon, and I can’t wait to see how they turn out. – And last year I did something I haven’t done in 20 years or more – I took a vacation, and went to Wyoming to take pictures!! I hope to knock a few more things off my bucket list this year. Stay tuned! Coming up this year, I want you all to be watching out for the movie, “Collar,” too. Five of my songs are in it! I’ve seen a sneak preview of it, and it’s a well-written movie, and you’ll recognize some of the actors – Tom Sizemore, Rebecca DeMornay, Richard Roundtree, and David Patrick Wilson. When it comes out in theaters, be sure to go see it, and let me know what you think! Here’s a link to a brief video snippet of my songs in the movie. As you can see, it was an incredibly busy year. This year I’ll be at home for a bit, working on a few secret projects. I’ll let you know when they’re almost ready to announce. And I’ve booked some very cool gigs already, including the Edmonton Blues Festival. I’m excited about some things I’ll be doing, and we’re entertaining other offers, too. Keep an eye on my tour dates page for all the latest. I’ll be at the IBC in Memphis next month! Who else is going?!? I hope to see you there! And stay tuned for news on baby goats. I have six pregnant mamas, and expect to have babies any day now! Brownie’s about to pop! May this be the first day of the best year of your life! I’ve been everywhere, man! I’ve been everywhere! Have I been busy lately! I’ve been traveling around the country, having a great time doing what I love – writing and playing music! My band and I were in Montgomery, Alabama on Sunday at the Capitol Oyster Bar. It’s been quite a while since we were there and we enjoyed getting to see our friends and fans in the area. And Memphis Billy was along for the ride. 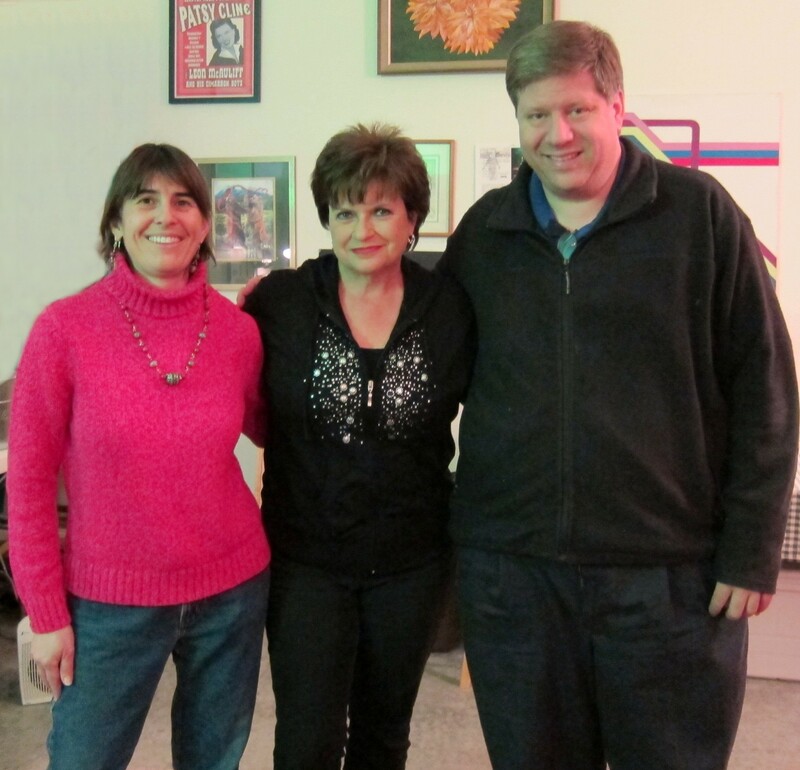 A few months ago I performed with an old friend Becky Hobbs and a new friend, Lucy Billings, at the Renaissance Theatre in Kingsport, Tennessee. We played an “in the round” songwriters night. It’s always inspiring to hear other writers songs. An “in the round” concert is when artists take turns performing their songs. I’ve always enjoyed this type of concert and I think it’s interesting for the audience to find out the thought process behind the songs. It lets them know where your ideas come from, and how a song develops. And at the end of July, I helped launch the Explore Georgia Songwriter Series at the Carnegie Library in my hometown of Dublin, Georgia! This was the first in a series of events, and I was honored to be part of the first one. Joining me was Levi Lowrey and Greg Hester. These two guys are successful writers, and I really enjoyed hearing their music, and getting to know them a little bit. Levi ended up jammin’ with me on the fiddle and we had a ball! I hope we can all work together again! The night before that I was in Sheffield, Alabama at George’s, a beautiful venue with great sound. 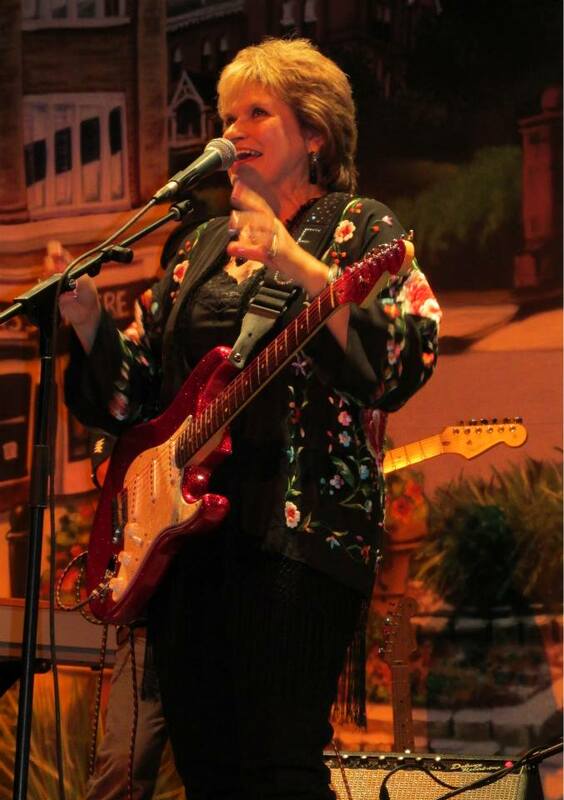 Thanks to Debbie Dixon and all those who came out to get their fill of the blues! And while we’re talking about songwriters, I spend some time in Nashville again, writing with Johnny Neel and Doug Jones, and we came up with some keepers! 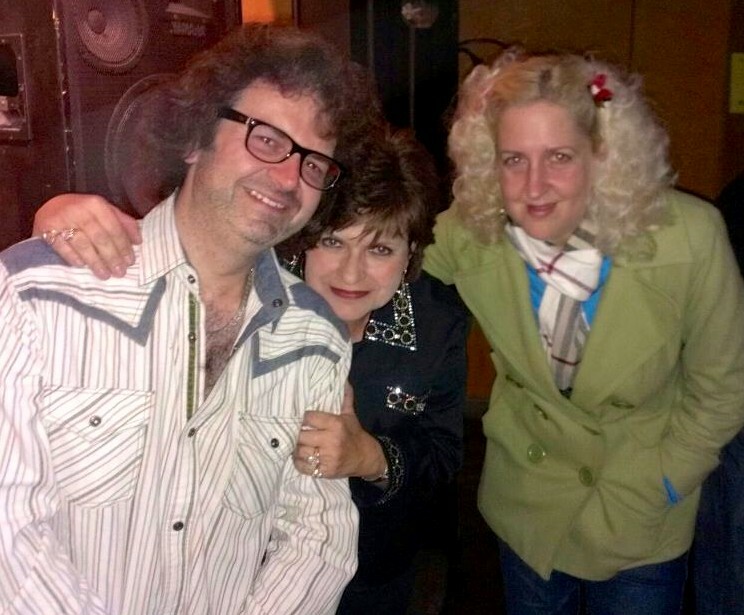 Johnny and I, and Joanna Cotten wrote a song that’s on Shaun Murphy‘s new album. I was honored to have another song on her album, too. I hope by now you’ve heard her CD. It’s a real true blues release and Shaun really belts it out. Check it out when you can! Recenty I also performed in another songwriters round at the Allman Brother’s Big House in Macon, Georgia with Sonny Moorman and Russell Gulley. I’d heard about them for a long time, and really enjoyed being with them. Thanks to Michael “Buffalo” Smith for letting me be a part of it. In mid-July I did a mini-tour in Ohio and Indiana. 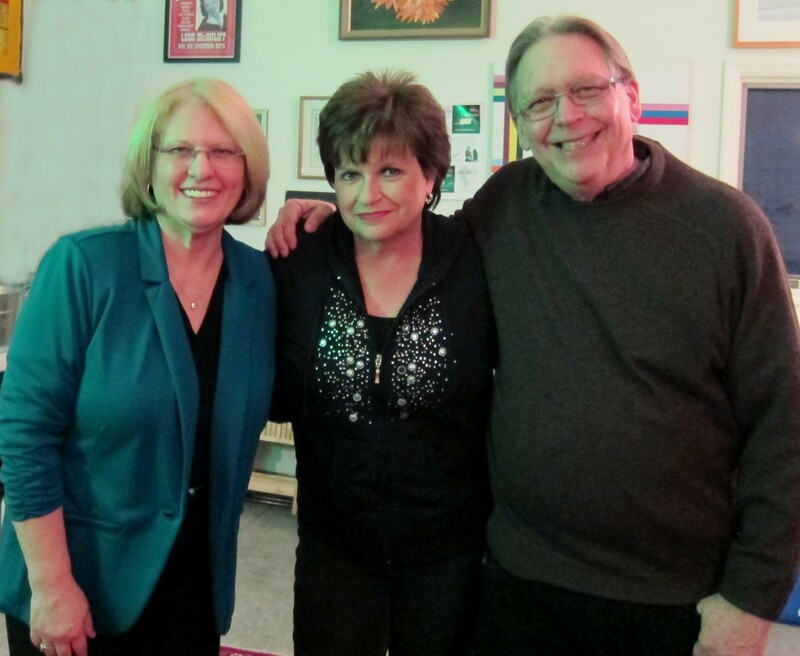 I performed again at one of my fave places, the Hey Hey Club in Columbus, then I did a house concert in Westerville, Ohio at the Hoover House Concert series. It was outdoors, on a lovely night, and Nancy and Roy were precious hosts. It was a magical night! The next night I helped kick off the new Indy Blues Society at an event at Wolfie’s in Noblesville, Indiana. It’s a good thing to see folks have such a passion for this great music and who are willing to start a society to help keep the blues going. 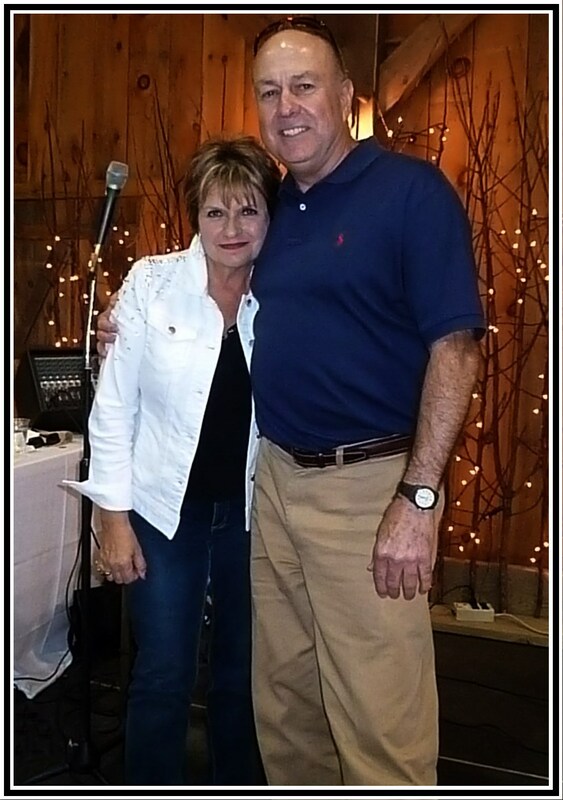 Marcia and Mark Adams are dedicated to growing this blues society, and I know they will. So many good things can come from being associated with the Blues Foundation. I’m just proud to be a part of it. I’m getting ready to head up to Ohio for the Cincy Blues Festival, and I’m really looking forward to seeing a lot of friends up there. Lots of my friends are performing on the same stage! After my set, Gaye Adegbalola will do a solo set, then Andra Faye and Scott Ballentine do a set. Then Gaye will join Andra for a “Saffire Reunion” with Cheryl Renee sitting in. This will be their first reunion since Saffire – the Uppity Blues Women retired. And even though Ann Rabson won’t be there physically, I know she’ll be there in spirit. I love performing, and I love sitting back watching my friends perform, too. I can’t wait! After the festival, I’ll be flying to Wyoming to have a whole week of learning more about my camera, taking photos, taking in the fresh air, and just being blessed by the beautiful surroundings. This trip has been on my “bucket list” for a long time. Hopefully I’ll come back with some new exciting photos. In the next couple of months I’ll be in Chattanooga, Pennsylvania, Georgia, Florida, Mississippi, and Nashville. When I’m home in between shows, I’m working on a new project that I hope will be ready in the next few months. I’ll let you know when it’s ready to show everybody. Keep an eye on my schedule and I’ll see you somewhere along the way! Until then, keep a song in your heart! Blues Music Awards, Goats, Tour dates, Wyoming, IBA Voting! I had such a great time at the Blues Music Awards in Memphis! It’s always great seeing old friends and meeting new ones. And this year I had the honor of presenting at the awards show, with the talented Eden Brent. There we were, two southern women, talking about the nominees, and handing out some awards. I just hope everyone understood our southern talkin’! 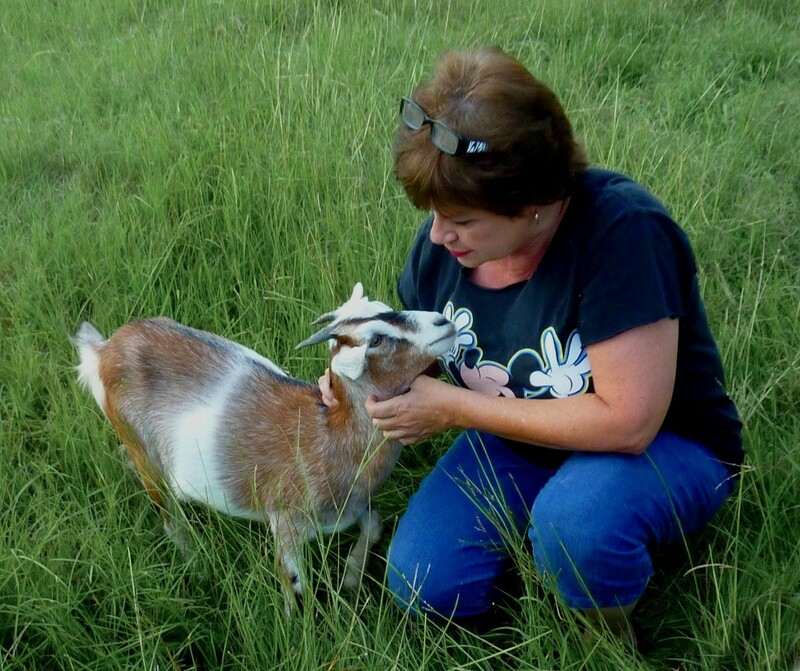 Our new Blues Foundation President, Barbara Newman, had called me weeks earlier to see if I could bring one of my goats to the show. I was afraid it would try to eat everything on stage, and fertilize it too, so I brought a stuffed goat instead. And now, Memphis Billy, my little stuffed goat is famous! Here he is after a long day in Memphis, ready for bed. Not long before heading to Memphis I found out that a fantastic artist, Shaun Murphy, had just released a new album with two of my songs on it. She’s what I call “a singer’s singer!” I had the chance to spend a little time with her in Memphis. Be sure and check out her CD, “It Won’t Stop Raining”. If you’re in the tri-cities area, up near Knoxville next week, y’all come see me at the Renaissance Arts Center in Kingsport, TN. I’ll be sharing the stage with Becky Hobbs and Lucy Billings, doing a “songwriters in the round” show. It’s gonna be a lot of fun, performing our original songs, and telling how they were born. Some tickets are still available. You can read all about Lucy and Becky, and get ticket info at http://www.bluesouthtalent.com/latest-news. I have a show coming up at the Allman Brothers Big House in Macon, GA in June. Michael “Buffalo” Smith and a couple other writers and I will be doing some original songs. And I’ve got some private parties, and house concerts coming up, too. I love performing at house concerts. I’ll be at several Ohio venues in June, and my Blue South Band and I have shows coming up at Bradfordville Blues Club in Tallahassee and Capitol Oyster Bar in Montgomery. Then in August I’ll be making a solo appearance at the Cincy Blues Festival opening for a Saffire reunion. Later in August I’m going to be doing something I’ve never done – flying to Jackson Hole, Wyoming to take pictures! This has been on my “bucket list” for a long time I’m so excited about this trip and look forward to giving my camera a work out! Be sure and keep an eye on my Tour Dates page because it changes all the time. I hope to see you on the road somewhere. Until then, keep a song in your heart! “15 Best Albums” list, New Year’s Eve party, free download, CD sale, songs in a new movie! I hope you’re all getting into the Christmas spirit! “Kindness” is the word for the season. If things seem overwhelming, just smile. I don’t think the good Lord intended for us to get stressed around his birthday. Let’s just slow down and breathe, and remember that a smile goes a long way, and sometimes that’s all someone needs. I’ve been one busy Songbird the last half of this year. I’ve traveled to South Carolina, Ohio, Florida, Connecticut, Kentucky, California, Tennessee, Indiana, Alabama, Pennsylvania, and back to Georgia, performing in a park, on a porch, at a festival, on the street, in a listening room, at house concerts, at an apple orchard, in a chapel, in clubs, and a theater. I love pickin’ and grinnin’ and I’ll make music anywhere! At the Fall Chapel Concert Series with my mama as special guest! Having fun with the dancers at the County Line Orchard! 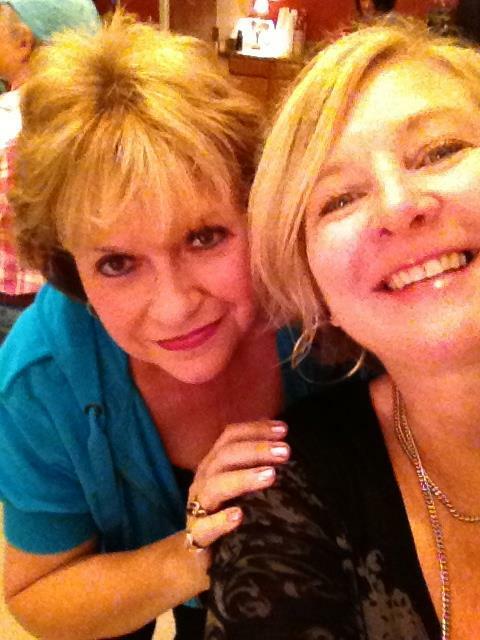 With Lisa Biales at Tom Carson’s house concert! Blues on the Porch with Val Starr and the Blues Rocket band! At Marg Henry’s house concert! It’s been great catching up with old friends and making new ones. That’s one of the perks of the music business. I’ve been so blessed to meet so many wonderful people through the years playing my music, and some end up becoming dear friends. I do a lot of solo shows, but I’m always thrilled to get to share the stage with the amazingly talented members of my Blue South Band. 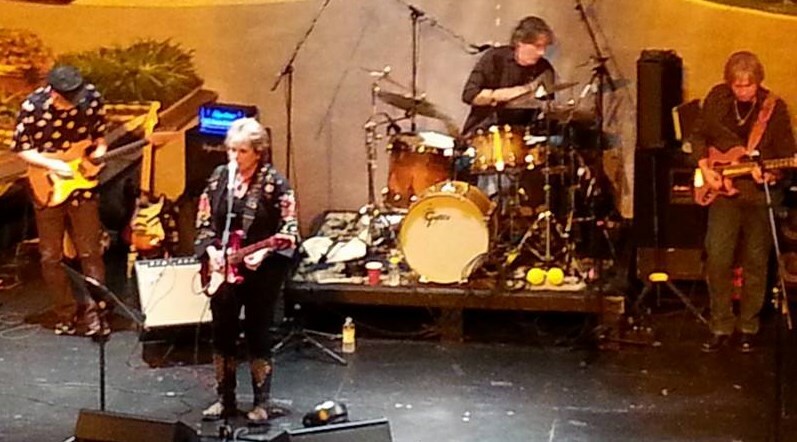 We performed a short set together at the Skydog 69 annual benefit concert honoring the legacy of Duane Allman. It’s always held around his birthday and the admission is cans of food which go to the Rescue Mission of Middle Georgia. I was so honored to be part of it, and it was great being with my band! A couple of months ago I got a request for some of my songs for an upcoming movie starring Rebecca DeMornay, Tom Sizemore, Richard Roundtree, and David Patrick Wilson! And they selected five of them, including a couple that I co-wrote with Tom Horner! I’ll keep you posted as things develop! In November I had four baby goats born. One of them, “Jazz” was shunned by his mama, but he now has a wonderful new home, and is at a goat “palace.” He’s being pampered so much that I’m thinking we should call him “Prince Jazz.” The other new babies are Cotton Top, Honey Boy, and Buttercup. They’re so cute, and they’re such great stress relievers. 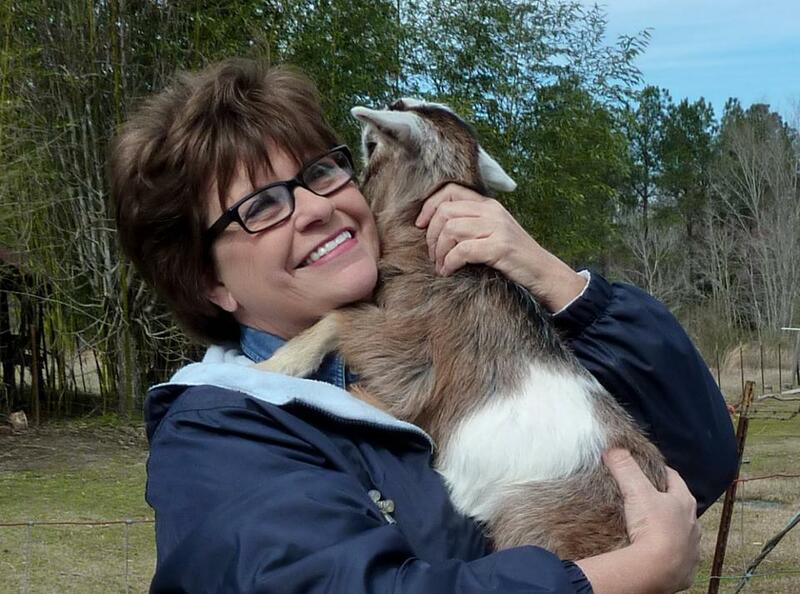 Everyone should have a pet goat! 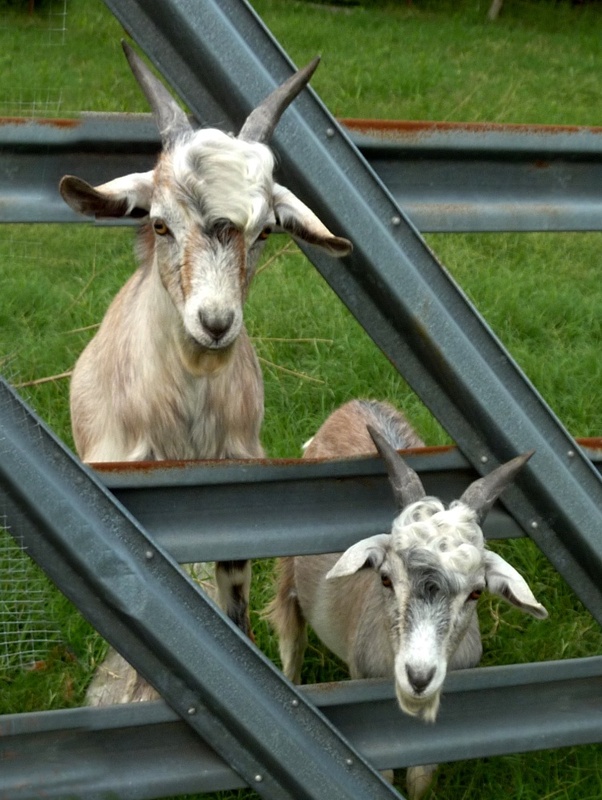 You can see all the latest pictures of my babies on the GOAT REPORT page. Here’s one of Buttercup curled up in a feed bowl. I’m getting geared up for the holidays, and looking back over an amazing year. I’ve been a lot of places, and done a lot of things. And I’m excited to now be raising awareness for the Johns Hopkins Encephalitis Center. They are on the cutting edge of research and education, and my hope is that one day people like me will get the right diagnosis, and the best possible care, with no lingering effects. Read all about it on the ENCEPHALITIS page. I’ll be performing on New Year’s Eve in Chattanooga at the Tropicana Room, and we’re gonna have a large time! Get your tickets on my Tour Dates page. Come on out and let’s bring in 2016 together! We have some more upcoming dates in the works, and as soon as we can, we’ll post the on my site. So keep checking my schedule. You never know when I might show up in your neck of the woods! And one final thing… We’ve got a few of my older CD’s left in the warehouse, so we’ve got all of them on sale now through the end of January. I’ve got to clear some out to make room for a new one! I’ll be working on it in 2016, and I’m excited about another new venture. Get a free download of “Holdin’ On,” and get some CD’s for your collection, and to give to your friends at http://www.EGKightMusic.com/music! Till I see you again, keep a song in your heart! My new album is on the charts! Peach Pickin’ Mamas in Muncie, and Chattanooga CD release party! I just wanted to post an update to let you know how my new album is doing. 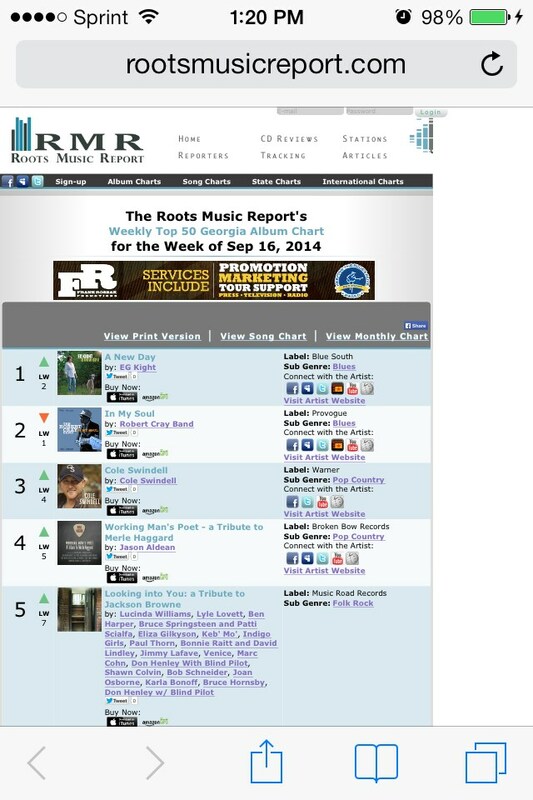 It came out last week and it landed at #1 on the Roots Music Report’s Top 50 for the state of Georgia! And now it’s #16 on the Top 50 Blues Album chart! And the song “Holdin’ On’” debuted at #32 on the Top 50 Blues Song chart! I can’t tell you how thrilled I am with the news! And it’s getting lots of great reviews and quite a bit of airplay. Thanks to all of you in radio who are helping to spread my music around, and to the media for helping get the word out! I had a wonderful CD release party at the Cox Capitol Theatre in Macon, Georgia last Friday. The theatre was full and the folks connected, and gave us what we needed to put on our best show. Thanks to my special guests, Diane Durrett, Paul Hornsby, and Gregg Brooks for adding so much to our show. My band, The Blue South Band, was on their A game, and it was an exciting night! 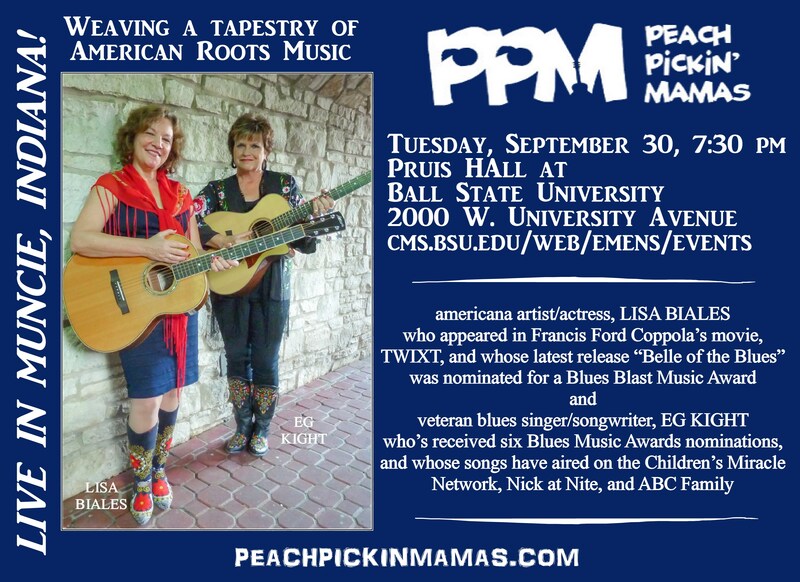 Now, I’m on to Muncie, Indiana to meet up with Lisa Biales to perform our “Peach Pickin’ Mamas” show next Tuesday. We always have a ball and laugh a lot. Lisa is such a sweetheart to sing with, and I look forward to every show we do together. 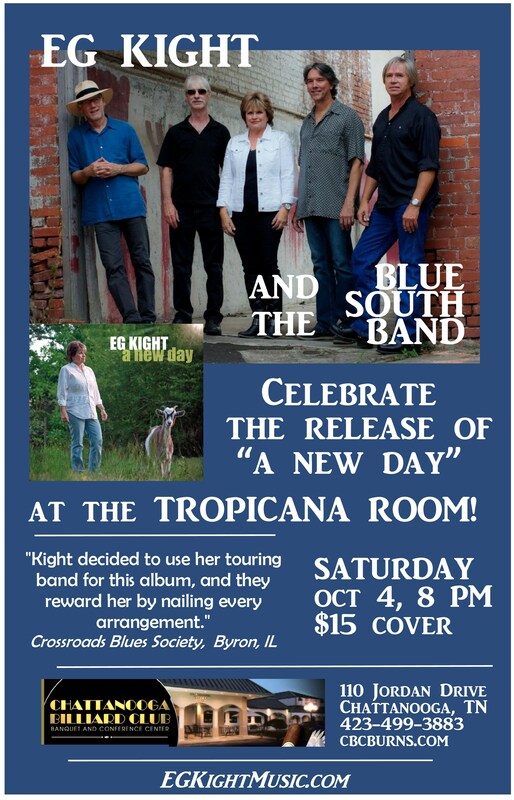 After Indiana, I’ll be heading to Chattanooga to meet up with my Blue South Band for another CD release party at Chattanooga Billiards East in the Tropicana Room on October 4th. I’ll be looking for all my friends and fans in that area to come out and hear my band and all the new songs! Keep an eye on my tour dates. I’ll be in Ohio the middle of October, then several Georgia dates, and then I’ll head up to Indiana and Michigan! I hope to see you soon! Until then, keep a song in your heart! A New Day is here!!! Today’s the day that my new CD “A New Day” is being released nationally!! I can’t wait for you to hear it! Click here for lots of options to get your copy. www.egkightmusic.com/music It’s available through my website, Amazon, iTunes, and CD Baby. We’ve made some updates to my website and I’d love for you to take a look. We’ve officially named my band “The Blue South Band,” and we’ve added their bios to my site. I do love these guys. They’re family to me. 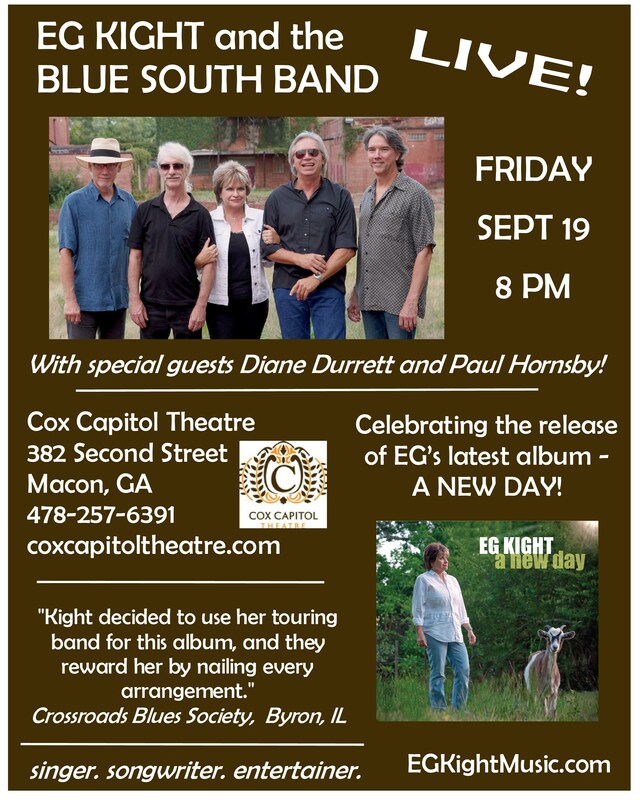 Read all about them at http://www.EGKightMusic.com/blue-south-band-bios. 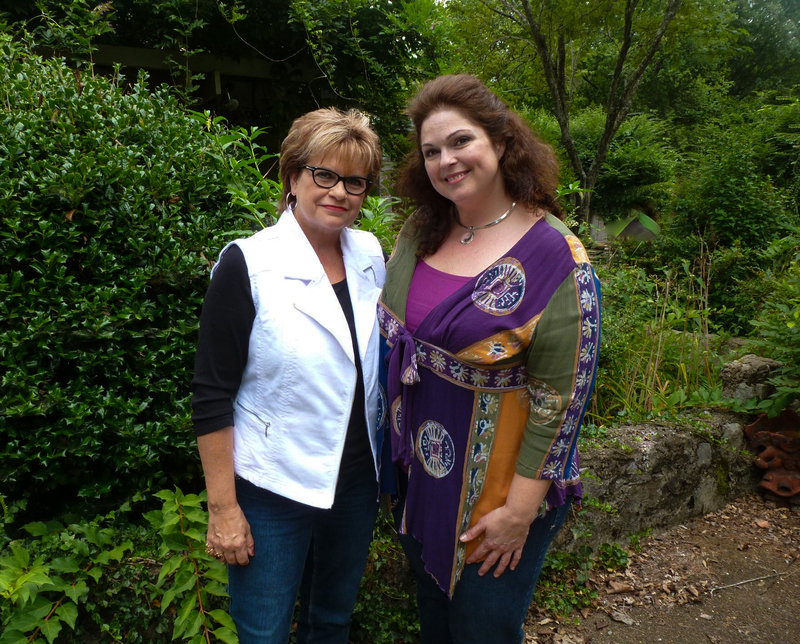 I’l be joining Lisa Biales at the end of the month in Muncie, Indiana for a “Peach Pickin’ Mamas” show then I’ll have another CD release coming up in Chattanooga on October 4th. Then I’ll head out for a few dates in Ohio. Keep an eye on my tour dates page, because we keep adding things. I sure hope to see you on the road, somewhere along the way. Until then…. Keep a song in your heart! A New Day is coming! A New Day is coming! And CD release parties are comin’ too! 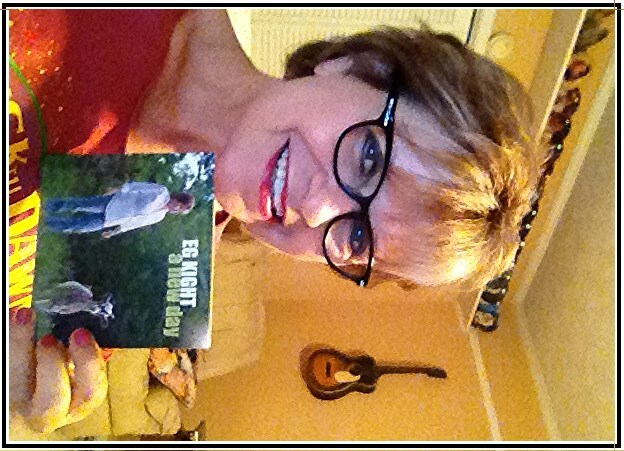 I’m so excited because I now have my new CD – A NEW DAY – in my hot little hands! We’ve sent it out to radio, and the media are getting their copies as well. It will be released nationally on September 16th, and it’s already getting some great reviews! You can read some of them under the REVIEWS tab above. While I was in Nashville recently, I got to do something I’ve never done there before – sightseeing! I sure enjoyed soaking up so many areas of the city. And I took this photo from the pedestrian bridge. I sure love Nashville! During that trip I also got to meet the artist who designed my last two album covers. I was thrilled to meet Cara Schneider, and she was just as genuinely sweet in person as she has been on the phone every time I’ve talked to her. Cara is the Art Director for the Nashville Opera, and she’s an incredibly inspiring designer. I’m so glad we got to visit and have some tea. Here’s a photo of us in her front yard. I have some CD release parties coming up, and we’re gonna celebrate in a big way! We’ve confirmed one in Macon, GA on September 19th, one in Chattanooga, TN on October 4th and a couple in Ohio later on in October. Just keep an eye on my TOUR DATES, because we keep adding more! My band and I tried some of the new songs out a few weeks ago in Tallahassee and they went over great. The crowd seemed to love them. That sure makes a songwriter feel good. Our first set was live on the internet from Bradfordville Blues Club, and it was awesome! You all know how I love to take pictures! I’ve taken some new ones recently, too, and I’ve updated my photography page. Check it out at www.egkightphotography.com and let me know what you think. I drove up to Hobart, IN near the end of July, and had the time of my life! It was a corporate event, for the owners of an oil company, and an apple orchard, among other businesses. I got to perform inside a huge barn, and the people I was entertaining were some of the sweetest people I’ve ever met! 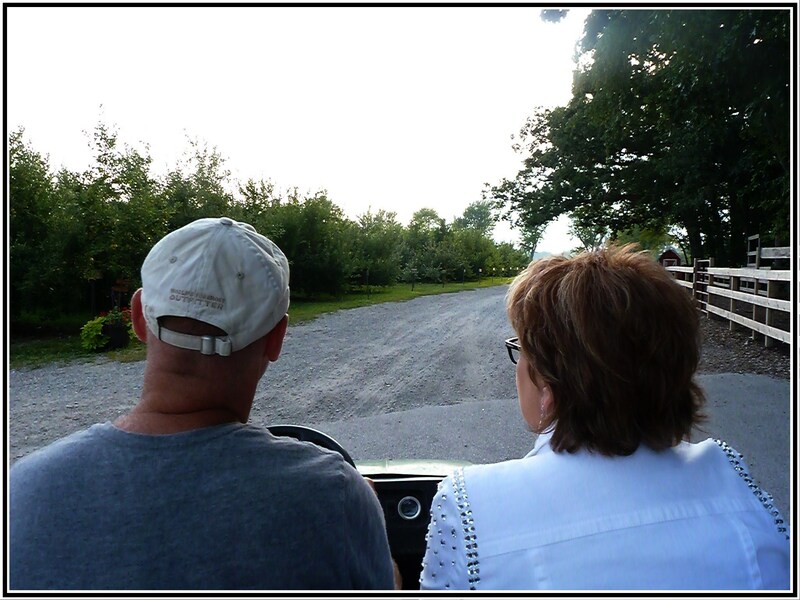 They even took me on a golf cart tour of the apple orchard, and I sure wish my mama could have been with me. She loves apples! I so enjoyed spending the afternoon with the Luke Oil folks, and I can’t thank them enough for their hospitality. I look forward to coming back your way one day soon. Thanks to Dana, and Tom, Sr., and Ryan, and everyone else who made this event such fun! I so appreciate all of you, and love the connection I have with you at my shows. You make me want to continue to grow as an artist, and to make people smile. Thanks for giving me the positive energy I need! You can pre-order my album now on my website, iTunes, and CD Baby, so you have a lot of choices! I can’t wait for you to hear it! Just click on the MUSIC tab above. 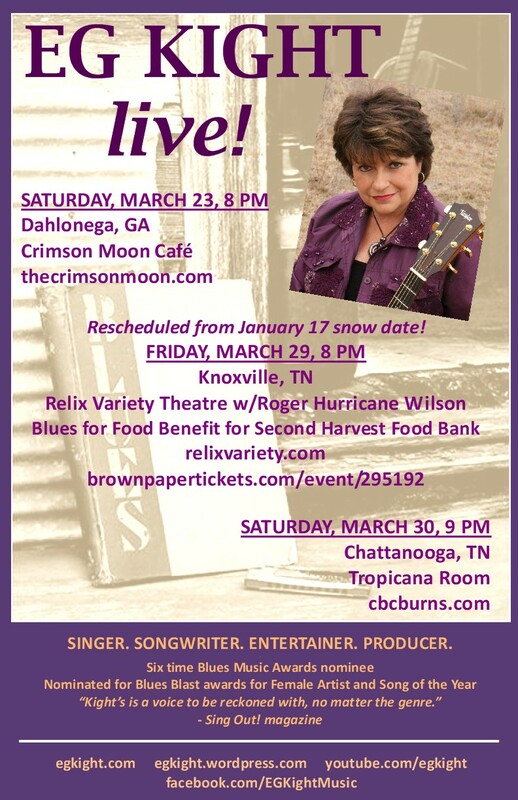 I’ll be in the north Georgia Mountains this Saturday, at the Crimson Moon Café in Dahlonega. Then I have shows coming up in Indiana with Lisa Biales as the Peach Pickin’ Mamas, in Alabama, Georgia, and Tennessee with my Blue South Band, and as a solo in Ohio. Keep an eye on my schedule, and I’ll be looking for you! Until then, keep a song in your heart! Shows in Ohio this weekend, my new photography website, Lisa’s new album, and my goats! I don’t know about you, but it’s been raining, raining, and raining in Georgia. My catfish pond has overflowed twice already and we’re still having some rain almost every day. At least it’s kept the temperature down compared to what it usually is down here in the south. Paul Hornsby and I just finished producing a new album for Lisa Biales. This is the second one we’ve worked on together and I think it’s terrific! It may be out in August some time. It’s called “Belle of the Blues” and I can’t wait for you to hear it. I get as excited about Lisa’s albums as I do mine! I’ve been busy performing in Arkansas, Tennessee and Georgia. Thanks to all of you who came out to my shows, picked up a cd and purchased one of my photographs. 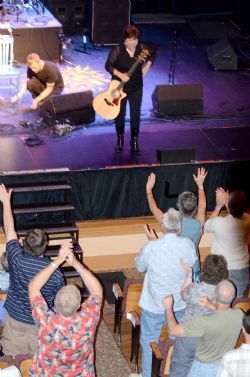 I got a standing ovation after my solo show at The Auditorium during Eureka Springs Blues Weekend! Speaking of photos, I now have a way for you to get them online. You can go to http://fineartamerica.com/profiles/eg-kight.html and check them out. I love taking pictures almost as much as making music. I’m not a professional but I sure enjoy it! I have some great shows coming up this week in Ohio. My band and I will be performing at the Cincinnati Blues Festival on Friday night, then I’ll be performing my solo show in Columbus on Saturday at the Hey Hey Club, and then Sunday I’ll be in Silverton performing at a benefit show for “Women Writing For A Change”. Next week I’ll be back at the Crimson Moon in Dahlonega with artist Heather Wilkerson. She will be painting on canvas, live to my music. It sounds like fun to me! My band and I will be back in Tallahassee at the Bradfordville Blues Club on August 17th. 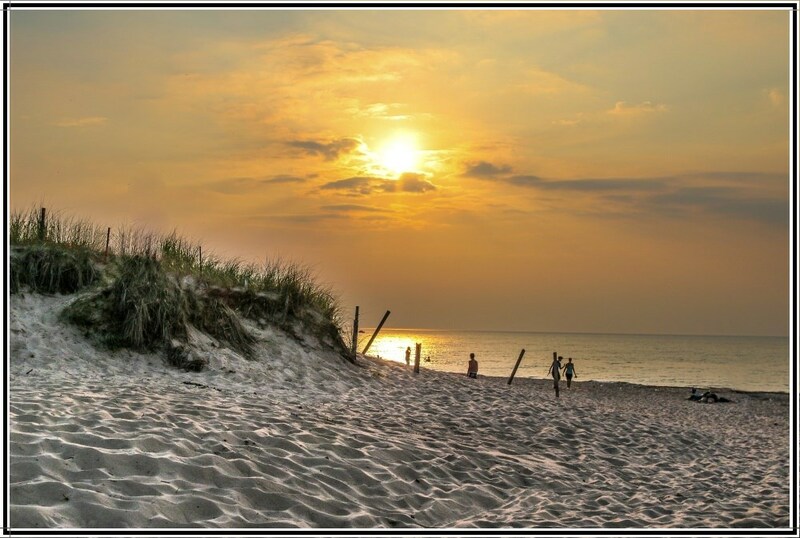 Now you talk about a fun place – this is one of the best! Then on August 24th I’ll be playing a songwriters night at Eatonton, Georgia at the Crooked Pines Farm in “The Barn”. I’m excited about this new venue and appreciate people who want to showcase songwriters. My goats are doing fine. My little boys are really getting handsome and Sippie is really growing. I’m so glad you all keep asking about my goats, and that you enjoy them! Until I see you, be sure and……keep a song in your heart. New songs, new photos, and acoustic shows coming up! I’ve been busy the last week or so working on some new songs, and taking some new pictures. If there’s two things I like to do, it’s making music and taking pictures. And I’m tickled that you all like them. I’ve got a new photograph called “Blues Diva”. Now I need to write a song to go with it! Come see me at my acoustic shows coming up. I can’t wait to see your smiling faces. Until then, Keep a song in your heart! Fun in Ohio, in the studio, upcoming shows in TN, FL, AL, GA, AR – and a few new dates added! A few weeks ago I was in Ohio where I had a natural ball! I performed two nights in Newark at the Midland Theatre, a beautifully restored building with wonderful acoustics. And the audience got to sit on the stage with me! I really enjoyed being up close and personal with my fans. I love that connection, and I feed off your energy. What would I do without you?! Then I was off to Columbus for a show at the Hey Hey Club. Needless to say I had several sauerkraut balls, their specialty! And I was blessed to have some great musician friends sit in with me. Thanks to Sean Carney and Long Tall Deb for joining me on stage! We had a great time together! The next night I was in Oxford at the Big Song Music House and my dear friend, Lisa Biales, sat in with me, along with her fiddle player, Doug Hamilton. That Doug can sure play some blues on that fiddle! It was great to have Bev Bowers and her friends there. She’s very active in the arts community in the Cincinnati area, and it’s always good to see her. It was another great night, and I always feel at home there. I’m at home right now, bottle feeding Sippie, one of my baby goats, and writing more songs. What a combination! I’ll be going in the studio next week to put a few of my new tunes down. I can’t wait for you to hear them. Hopefully I’ll have a new album out before too long. At least this is a start. Look out for me in the coming weeks in Georgia, Tennessee, Florida and Alabama. The dates are below. I hope to see you soon somewhere down the road! Dates and times are subject to change. Please confirm with the venue before making travel arrangements. 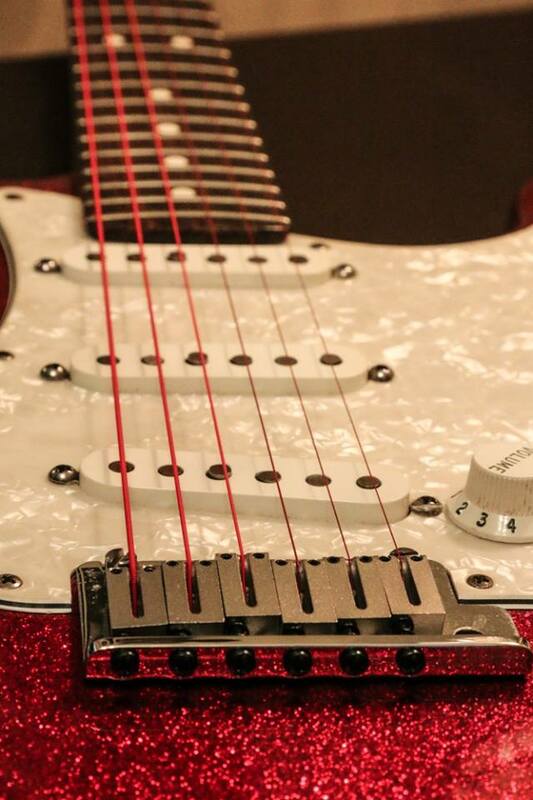 SHOP – Guitar String Jewelry! Thank you for your purchase! I’m recovering, and on the road again! I’ve been on the road! Festivals, concert series, apple orchard, yacht club, songwriters night, and everything in between! Goats, songs, gas pumps, Mama, Chattanooga, and Canada!